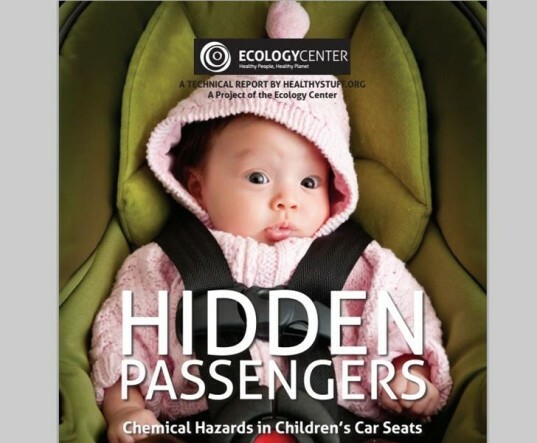 The most current research on toxic chemicals found in children’s car seats was released today by the nonprofit Ecology Center at www.HealthyStuff.org, and some of the results are shocking, showing that chemical reform still has a long way to go. 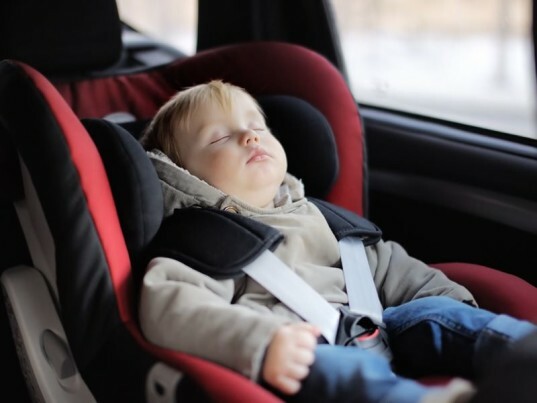 According to the report, nearly 73% of car seats tested contained hazardous halogenated flame retardants and over half contained non-halogenated organophosphate flame retardants. Worse, the study finds that the flame retardant chemicals and alternatives used by companies who make car seats are poorly regulated. Some companies have made strides in safe car seats such as Britax and Clek while the poorest performing company in this report was Graco. Keep reading to learn more about this new research. 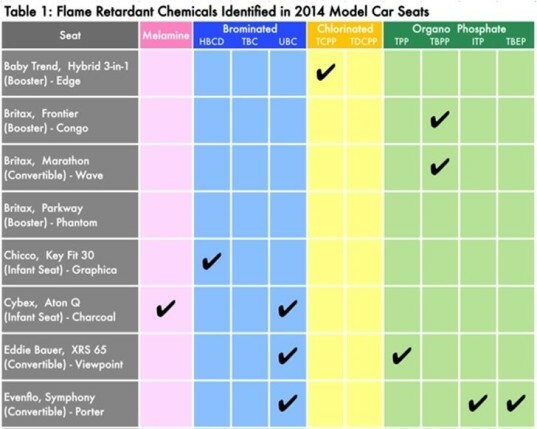 For this new report, fifteen 2014-model car seats were tested for specific flame retardant chemicals by gas chromatography/mass spectrometry. The organization tested the seats for bromine (associated with brominated flame retardants), chlorine, lead, and other heavy metals. According to the report, these substances were tested for as they’ve, “been linked to thyroid problems, learning and memory impairment, decreased fertility, behavioral changes and cancer.” Another issue is that both heat and UV-ray exposure in cars can accelerate the release of these chemicals, plus many children spend hours in a car every week, which can potentially expose them to harmful flame retardants. The report notes that safer car seats are a very big deal because babies are the most vulnerable population in terms of chemical exposure, with bodily systems that are still developing. 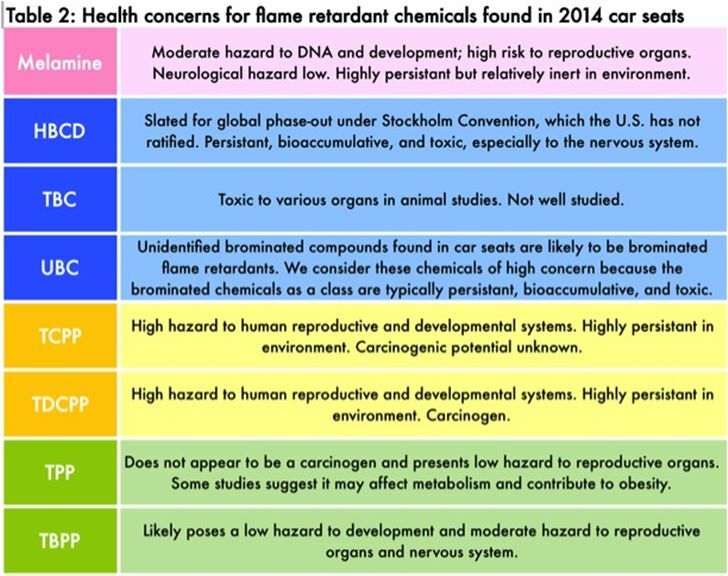 No car seats tested were 100% free of chemical hazards, but some fared better than others. Britax, Clek, Graco, Baby Trend, Chicco, Cybex, Dorel Juvenile Group (Eddie Bauer, Safety First), Evenflo, Harmony Juvenile, Orbit Baby, and Peg Perego car seats were all tested and not one was free from all chemical hazards. According to lab research conducted for the report, all car seats contain at least one chemical flame retardant in order to meet the federal fire test standard for vehicle accessories. Some manufacturers, such as Britax and Clek, have moved away from the more dangerous flame retardants due to their toxicity, using safer halogen-free phosphate chemicals instead. One stroke of luck discovered during this study was that zero PBDEs were found in the sample set of car seats. Other brominated chemicals were found though in almost two-thirds of the tested car seats. These brominated replacements have potential health risks and are still highly persistent in the environment. Chlorinated flame retardants were detected in 29% of the tested seats. 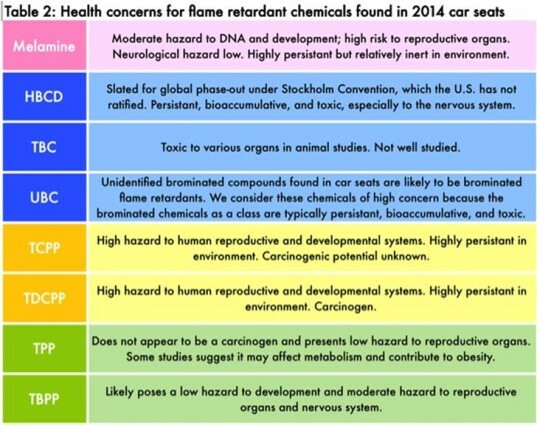 First of all, remember, the report only tested 15 car seats, so these seats fared the worst out of just 15, although the report also shows that car seats don’t have to contain tons of chemicals as shown below by the best seats tested. Seats by Peg-Perego, Cybex, Orbit Baby, and Baby Trend were found to have higher levels of chemicals than other seats tested. The highest chemical seat tested for this report was the Graco My Size 65 Convertible Seat. 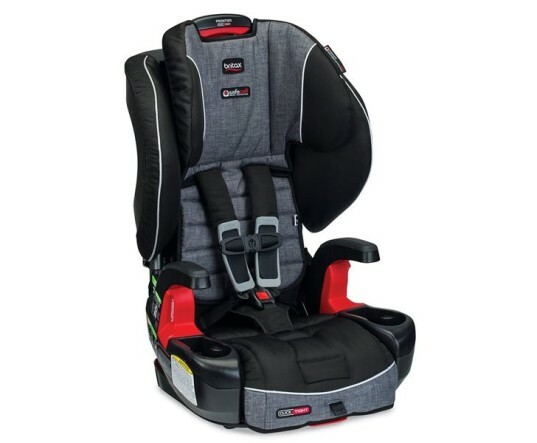 Based on this research, HealthyStuff.org is now asking Graco, one of the largest manufacturers of car seats, to take action and provide a positive leadership example to other car seat makers by disclosing and phasing out hazardous chemical flame retardant additives. Consumers are encouraged to sign a petition to Graco at HealthyStuff.org. Complete product rankings and the ranking methodology of all car seats tested are available at HealthyStuff.org. For this new report, fifteen 2014-model car seats were tested for specific flame retardant chemicals by gas chromatography/mass spectrometry. The organization tested the seats for bromine (associated with brominated flame retardants), chlorine, lead, and other heavy metals. According to the report, these substances were tested for as they've, "been linked to thyroid problems, learning and memory impairment, decreased fertility, behavioral changes and cancer." 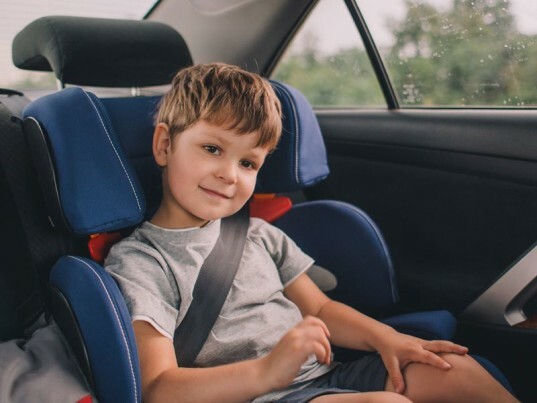 Another issue is that both heat and UV-ray exposure in cars can accelerate the release of these chemicals plus many children spend hours in a car every week, which can potentially expose them to harmful flame retardants. The report notes that safer car seats are a very big deal because babies are the most vulnerable population in terms of chemical exposure, with bodily systems that are still developing. 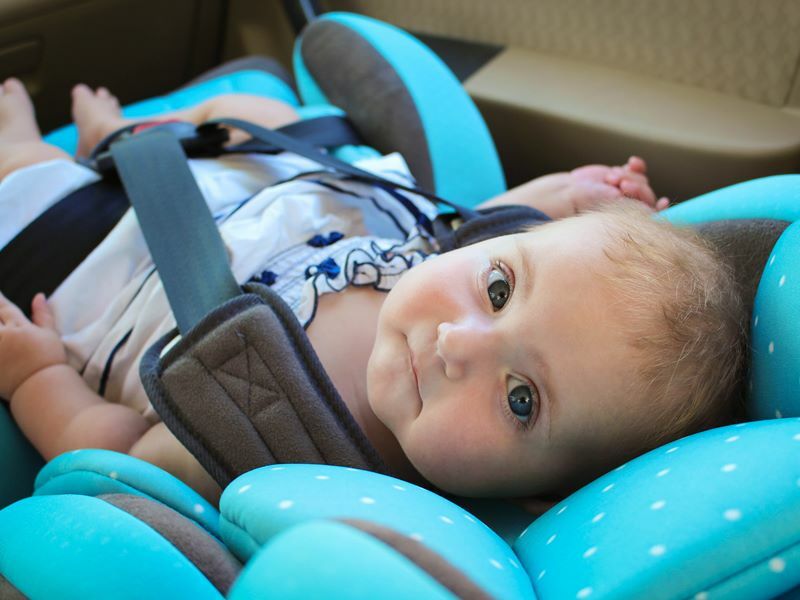 No car seats tested were 100% free of chemical hazards, but some fared better than others. First of all, remember, the report only tested 15 car seats, so these seats fared the worst out of just 15, although the report also shows that car seats don't have to contain tons of chemicals, as shown below by the best seats tested. Seats by Peg-Perego, Cybex, Orbit Baby, and Baby Trend were found to have higher levels of chemicals than other seats tested. The highest chemical seat tested for this report was the Graco My Size 65 Convertible Seat.